Executive producer Todd Helbing promises the fourth season of The CW’s The Flash will return the series to a lighter tone after what he admits was the show’s darkest season with season three. 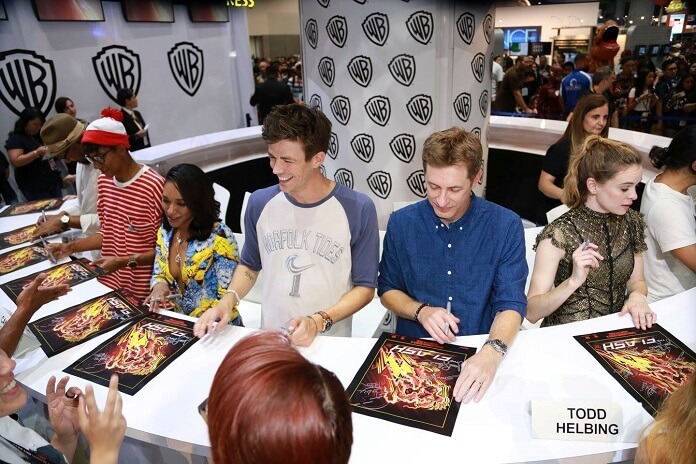 Helbing and The Flash cast, including Grant Gustin, Danielle Panabaker, Candice Patton, Tom Cavanagh, Jesse L. Martin, Carlos Valdes, and Keiynan Lonsdale, discussed the upcoming fourth season while at the 2017 San Diego Comic Con, participating in a panel crowded with fans and in a slightly quieter press room for roundtable interviews. During our interview, Helbing also talked about the season four villain: The Thinker. How much time is Barry going to be spending in the Speed Force? Will you be bringing him back quickly? Will we see him inside the Speed Force or will it start with his return from the Speed Force? What can you say about the season’s crossovers? Will Team Flash be still as strong as when Barry left or have they faltered in his absence? Last year you had the musical crossover. Is there something unusual you’re planning for this year? Can you talk a little bit about the big picture and the tone of the season? Will the Caitlin/Killer Frost storyline be totally separate from the rest of the team? Is Tom Felton coming back? Can you talk about the new villain? Todd Helbing: “Yeah, it’s The Thinker. Last year we said his name twice, Clifford DeVoe. And he is the smartest guy on the planet. You know, the phrase we keep saying is that it’s the fastest man alive versus the fastest brain. Is there anything ambitious to pull off in season four in the way that you pulled off Grodd or King Shark?